See-through organs and bodies will accelerate biomedical discoveries. The ability to see through organs and even the entire body to visualize long-range connections between cells as well as fine-grained cellular structures has been a long-time dream of biologists. A study published in the journal Cell has now made that dream a reality, revealing simple methods for making opaque organs, bodies, and human tissue biopsies transparent, while keeping the cellular structures and connections intact. The protocols could pave the way for a better understanding of brain-body interactions, more accurate clinical diagnoses and disease monitoring, and a new generation of therapies for conditions ranging from autism to chronic pain. Although the idea of tissue clearing has been around for a century, this is the first study to perform whole-body clearing, as opposed to first extracting and then clearing organs outside the adult body. The methodology has the potential to accelerate any scientific endeavor that would benefit from whole-organism mapping, including the study of how peripheral nerves and organs can profoundly affect cognition and mental processing, and vice versa. Three-dimensional maps of intact organs and bodies are crucial for understanding complex, long-distance cellular interactions that play an important role in a range of biological processes. But until now, methods for making whole organs or bodies transparent and thus amenable to imaging and generating 3D maps have been limited to the brain or embryos. The team previously developed a brain-clearing technique called CLARITY, which involves embedding tissue into hydrogels to preserve its 3D structure and important molecular features, and then using detergents to extract lipids that make the tissue opaque. In the new study, the researchers set out to make CLARITY suitable for whole organs and bodies, in part by making the process faster. First, they identified the optimal hydrogel that allows detergents to quickly remove lipids from tissue using an approach named passive CLARITY technique (PACT). To markedly speed up the clearing process without causing tissue damage, they introduced an innovative procedure called perfusion-assisted agent release in situ (PARS), which involves directly delivering the hydrogel and clearing reagents into the bloodstream of intact rodents. The reagents diffused throughout the tissues and completely clarified organs such as the kidney, heart, lung, and intestine within 2 to 3 days, while the whole brain and entire body cleared within 2 weeks. The researchers also developed a recipe for refractive index matching solution (RIMS), which enables the long-term storage of cleared tissue and imaging thick, cleared tissue using a conventional confocal microscope. The new methods allow for the analysis of intact connections between cells as well as structures and molecules within single cells using standard genetic and molecular biology techniques. The easy-to-use tissue clearing protocols, which employ readily available and cost-effective reagents and equipment, will make the subcellular interrogation of large tissue samples an accessible undertaking within the broader research and clinical communities. PARS Allows Rapid and Uniform Clearing and Immunolabeling of Major Organs. 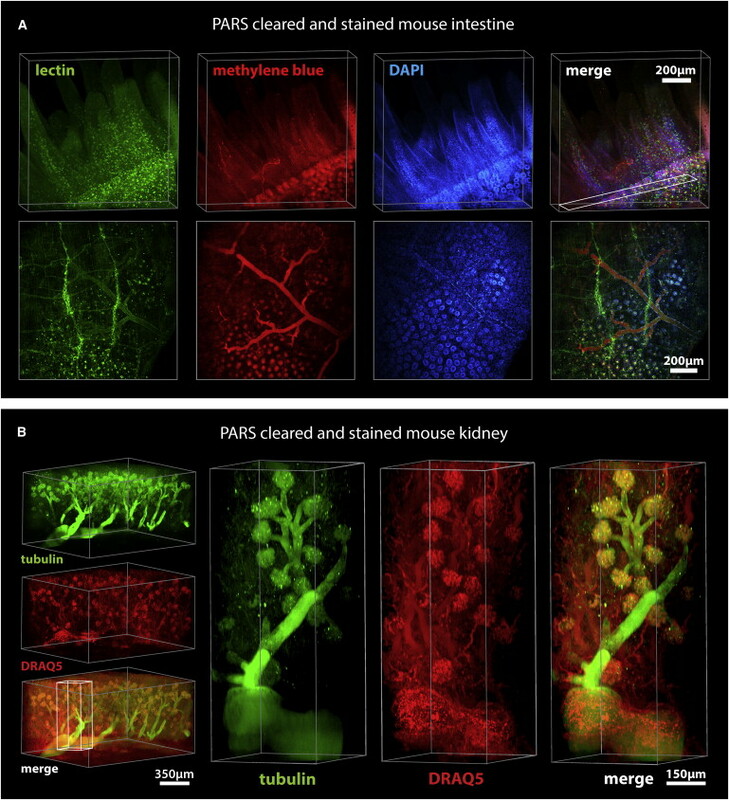 (A and B) Clearing and immunohistochemical labeling was achieved in whole mice through PARS alone. (A) PARS-cleared mouse intestine was stained with lectin, methylene blue, and DAPI, and imaged through a depth of 500 μm. (B) A whole kidney was imaged (left) for anti-tubulin antibody and DRAQ5 labeling. High-magnification images (right) of the indicated region and the structure of glomeruli, demonstrating that PARS enables antibody-based labeling throughout the kidney. Gradinaru et al 2014.